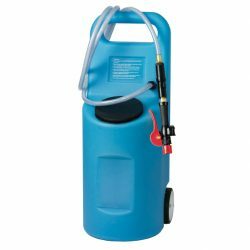 The 10-Gallon AC-Powered Watering Cart helps small to mid-size operations easily and efficiently water forklift batteries. The 13-foot power cord combined with the 12-foot output hose gives the Watering Cart a convenient 25 total feet of reach. Keeping lead-acid batteries filled with electrolyte to the proper level extends battery life and ensures maximum performance. The 10-Gallon AC-Powered Watering Cart makes precise filling easy with its maneuverability and included BHS Water Gun. The ergonomically designed Water Gun quickly fills cells to the precise level before automatically shutting off. BHS engineers have eliminated post-shutoff drip, meaning electrolyte levels will be exactly where they should be. There are many choices for battery-watering equipment, but investing in BHS Water Carts gives you an ergonomic and economical way to water batteries. Our wide array of products are designed to meet the needs of all sizes of fleets. Make battery watering faster, easier, and more precise with ergonomic solutions from BHS. Contact our sales team at 1.800.BHS.9500 to learn more about how Watering Carts and other Battery Watering Devices can help your forklift batteries last longer.